Chloe Jackson led the Lady Tigers with 21 points and nine boards, while Raigyne Louis added 18 points. Tennessee shot 53 percent in the opening frame and recorded seven assists on eight baskets to grab a five-point advantage. Jaime Nared paced the Lady Vols with six points on 3-of-4 shooting in the period. 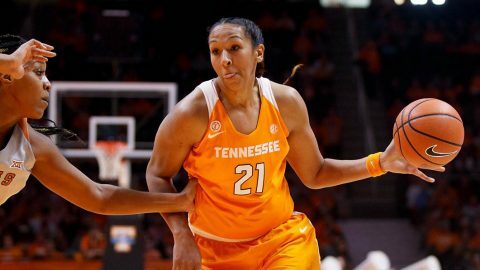 After a pair of quick baskets brought LSU back to within one early in the second quarter, the Lady Vols answered with an 11-2 run to put themselves ahead by 10 for the first time of the afternoon. However, LSU was able to hold UT to just two points and no field goals over the final five minutes, and a putback by Louis as time expired trimmed the Tennessee lead to 31-26 heading into the break. Russell led the way with eight points and four rebounds in the first half. Westbrook also had a strong showing, recording six points and five assists while controlling the pace of the UT offense. LSU fought its way back in the early stages of the second half, going on a quick 10-4 run to claim its first lead since the 8:52 mark of the first quarter. A Russell turnaround jumper late in the period ended a Tennessee scoring drought that nearly lasted four minutes. The Lady Tigers shot 42 percent from the field and held UT to its lowest point-total in a third quarter this season (nine) to take a 45-40 lead into the game’s final stanza. After Jackson knocked down a 3-pointer for Tennessee to open the fourth quarter, an 8-0 LSU run highlighted by six points from Chloe Jackson gave the Lady Tigers their first 10-point advantage. While UT tried to claw its way back down the stretch, LSU maintained key possessions with eight offensive rebounds in the quarter. LSU was able to put the game away late at the free throw line and forced four turnovers on the defensive end during the period.